The following simulation model is designed to assist administrators in projecting the resources required to run a successful voice broadcast phone campaign. Because of the complexity of this model, the voice broadcasting simulator requires the input of a number of parameters to accurately estimate the performance of this type of phone campaign. There are two basic types of voice broadcasting campaigns - simple message only and "press through". A "press through" campaign allows the call recipient to press a phone key to talk with one of your representatives. A "press through" call requires 2 lines during the communications process - one line for the initial outbound call and the second line for the transfer to an outside number. These resources are consumed as long as both parties continue talking. To simulate this type of campaign requires additional information about the phone configuration and voice broadcast program. The results of the voice broadcast simulation is a report which analyzes the effective use of both telecommunications and people resources. A sample simulation report and an analysis appears below. The following is an example of the results the voice broadcasting simulator can produce. (Live Answer Only) - Only leave a message if the phone system detects a person on the phone. (Live Answer With Press Through) - Only leave a message for a live person, giving that person the option to "Press Through" to talk with an agent. (Answer Machine Only) - (Not encouraged) Some campaigns may only wish to leave a message on an answering machine and ignore all other types of connects. (Live Answer and Answer Machine) - Combination of Live Answer and Answering Machine Campaigns. In this case, two different messages or the same message may be broadcast. (Live Answer and Answer Machine with Press Through) - Combination of Live Answer "Press Through" and Answer Machine Campaign. Two different messages MUST be left in this campaign. Phone List Size - This is the number of phone numbers contained in the list provided to the voice broadcasting system that will dialed. Number Of Lines Dedicated To Dialing (Not Including Agent Lines) - Our voice broadcast system comes with any number of digital or analog phone lines. All or part of this configuration can be dedicated to running a particular voice broadcasting campaign. This is the number of phone lines that will be used for dialing the above list of phone numbers, excluding any lines that may be required if the campaign is a "Press Through". Number Of Passes Attempting To Contact Each Number - Our voice broadcast system can attempt to re-dial phone numbers that were originally busy or no answer. If more than one pass is requested, the campaign will require additional time to complete. Generally a voice broadcast campaign will make a maximum of three attempts to complete a call. Message Length (Seconds) - This is the length of the message broadcast during this campaign (in seconds). Generally 30 second messages seem to be the most effective for voice broadcasting campaigns. (live answers detected) - dialer detects a live person answering the phone call (default 32%). (fax or disconnected) - A bad number (or fax) is detected. Call will not be re-dialed (default 7%). (no answers) - No one answers the call - re-dial potential (default 7%). (busy signals) - dialer detects a busy signal when calling a number - re-dial potential (default 3%). (Hang Up Before Message Completion) - This is percentage of call recipients who hang up prior to the completion of the phone message (default 20%). For simulation purposes, 10 seconds is assumed to elapse on average before the hang up. (Listen To Entire Message) - This is the remainder of call recipients who listen to the entire message (default 80%). Live Connect Percentage of "Press Throughs" - This is the percentage of live answers that eventually "Press Through" to an agent. Example, assume 1000 calls are placed and 300 are answered by "live" individuals. If 30 people opt to "Press Through" to an agent, this would represent 10% (30 out of 300). This number is generally quite small for a cold call campaign, but could be much higher with a "free" promotion or targeted audience. Average Talk Time of "Press Throughs" (in Seconds) - This is the average amount of time that the individual who opts to "Press Through" actually spends on the phone talking with an agent. 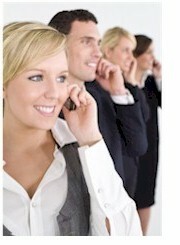 Number Of Additional Agent Lines Required - Additional phone lines are required to perform "Press Through" campaigns. When a "Press Through" is requested, the voice broadcast system "dials" an outside line and connects both parties. If the dialer has more individuals requesting "Press Through" than lines available to be transferred, the call will be discontinued. Live Connect Percentage of "Press Throughs"
The above results demonstrate how closely the voice broadcasting simulation approximated the input parameters set by the administrator. As you can note, the percentages of the input variables and the results achieved by the simulator were within a percent or two of each other. The simulation run results listed below present the projected run time and statistics associated with this voice broadcast simulation. 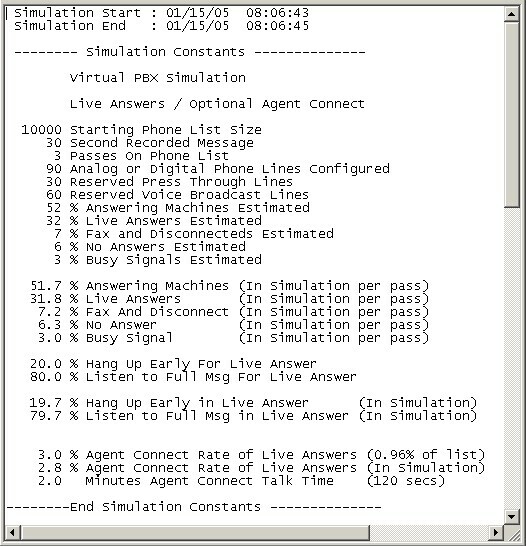 The following table itemizes the results of this simulation and can assist the call center manager when allocating resources to a voice broadcasting campaign. This campaign was run in 1 hour and 28 minutes, calling 10,000 numbers with 30 agents standing by waiting for "Press Through" calls. Approximately 2500 telecom minutes were consumed performing this campaign. This includes the message delivery time to live answers as well as the talk time between agents and live answer after "Press Through". Approximately 3500 messages were delivered during the 3 passes. This approximates the initial connect rate of 32% of the phone list during the first pass, with subsequent passes picking up additional live connects. Based upon this configuration, the average wait time for a live answer to be connected to an agent was 15 seconds (based upon the time required to dial the agent after "Press Through request). There was no client wait time because no agents were available. 97 call recipients requested contact with an agent during the approximately 1 1/2 hour campaign. Agent utilization was only 7.3% of available time. Recommended agent staffing is 7 agents. 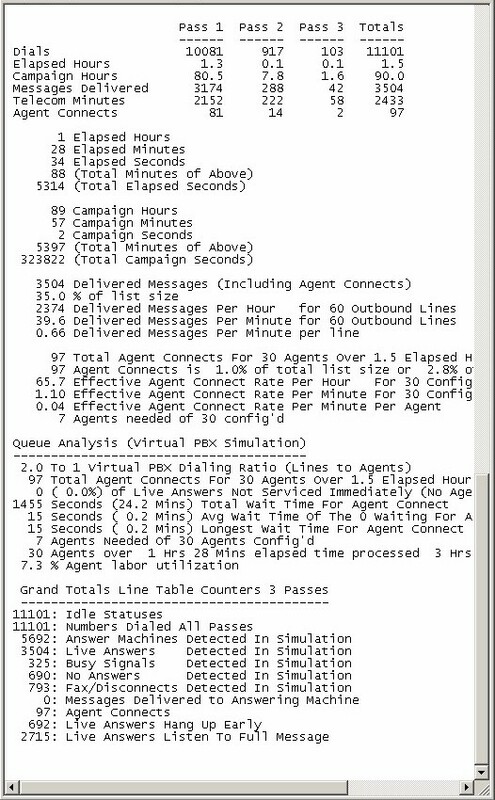 The simulation can be run again using fewer agent lines to determine an optimal mix between idle agent time and time for call recipients to wait for next available agent. Also, the average talk time between agents and callers may vary and the simulation can be modified to view the results if this amount of time is higher or lower. "Press Through" rates may also vary, and this will certainly affect staffing. The true management question is the lost value when your agents are idle versus the number of "Press Through" calls that will frustrate the call recipient if he or she has to wait too long for an agent to become available. If your objective is to keep your agents as busy as possible and your cost associated with losing a call is low (high volume, low value product), then a high line-to-agent ratio works better. If the cost associated with losing a potential caller is high (high value, low volume product), then a lower line-to-agent ratio is better. The best scenario is a blended operation where your agents can perform other tasks while waiting for "Press Through" calls. Contact DSC for a FREE IVR simulation run and analysis and to learn more about our call center products and services.